The Empty Bottle, in Chicago’s Ukrainian Village, is everything you’d ever want out of a rock venue: it’s a little dingy, it’s very loud, the beer is cheap. On Mondays, they put on free shows. Oh yeah, and the green room walls are covered in drawings of dicks. It’s my first time in the Bottle’s green room, and I sit on a couch with NE-HI singer/guitarist Jason Balla, waiting for the rest of his band to arrive. This place is a second home for Balla and his fellow singer/guitarist Mikey Wells—the former works sound here, the latter works lights and door—so they’re completely unfazed. In a way, the aesthetic down here matches NE-HI’s general outlook on life and music: don’t let thought get in the way of your ability to live and laugh. 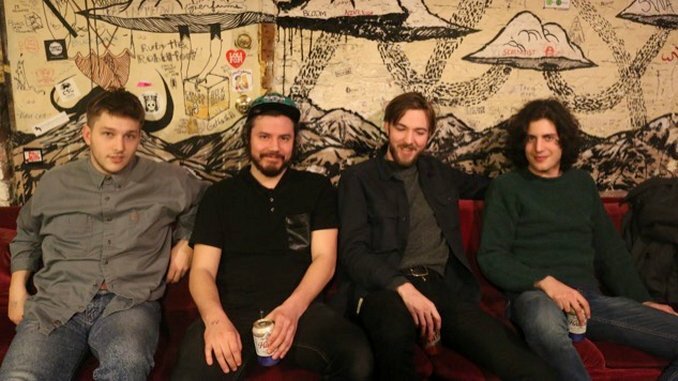 Their debut, eponymous LP, released in 2014, has ridden its lyrical simplicity and straightforward, jangly guitar riffs to popular and critical acclaim in the city, where the Chicago Reader named NE-HI the best band primed to break out this year in June. And with a November tour opening for Car Seat Headrest under their belts, they seem ready to take a national-level step when their sophomore album, currently in the works, is released later this year. Their craft, however, is just about the only thing they take seriously. “We’re walking up to the Stone Cold Steve Austin music,” Balla says of tonight’s show. NE-HI formed in 2013, when Balla, Wells and bassist James Weir, who were all studying at DePaul University, were asked to score a friend’s film. Alex Otake hopped in on drums, they started jamming, and though the movie never materialized, a band was born. NE-HI quickly and naturally adopted their signature sound, a fusion of ‘60s surf rock and the ‘80s college scene, with a proclivity toward Roger McGuinn-esque guitar tone (without an actual 12-string—”it’s too much work to have one of those…and I don’t have the money,” quips Wells). They started playing around Chicago’s vibrant DIY house scene with bands like Twin Peaks—whose keyboardist, Colin Croom, chills with us in the green room—and working on their self-titled debut, which took the better part of a year to write and record. Balla points to the freshness of the whole endeavor as NE-HI’s source of inspiration on the album. “[It was] kind of the discovery of being a band. It was kind of an exciting energy that was what we were all caught up in,” he says. “Figuring out what we do, basically, and then when it worked, it was like okay, let’s do that,” adds Wells. That sort of blithe, spontaneous energy manifests itself in a few ways. NE-HI’s lyrics tend to feature just a few lines, often repeated. For example, one song off their debut album, Since I’ve Been Thinking, consists of the following words: “It’s been awhile since I’ve been thinking at all/It’s been awhile since I’ve been thinking of you.” Though more recent (excellent) singles like “Turncoat” and “Drag” feature slightly more words, there’s something to be said for expressing a single, fleeting, relatable thought and jamming it out in selfless bliss. NE-HI can pull it off, because the music itself hugs your ear the ways The Strokes’ did on Is This It, and they go nuts in the best possible way for live performances. Part of that undoubtedly stems from their house show roots; the Chicago scene is frenetic and volatile, marked by crazed shows and the constant opening and closure of various DIY venues. “You went on a good drunk rant about this the other night,” Weir reminds Otake. I don’t find this at all surprising; even in a group of jokesters, Otake stands out for his exuberance and penchant for off-beat one-liners. His suggestion for how to improve NE-HI’s live show: T-shirt gatling guns. But more than anything, the band is simply overcome by infectious ecstasy whenever they take the stage. Balla, in particular, heaves with the beat as if it’s sending electrical impulses through his musculature. It’s an energy that turns even slower-burning songs like “Turncoat,” which stands out mostly for its expanse and powerful unison vocals, into manic affairs. A ways through our interview, the Bottle’s genial lights guy, Zack, interrupts to ask how NE-HI wants to illuminate their set. “Umm, strobes the whole time?” Balla jokes. The band eventually settles on green, orange and pink. “If there’s a mosh pit, we have to stop [the lights] and deal with that,” Zack remarks. “Do you expect that to happen?” I ask. Later that night, the sold-out crowd moshes as NE-HI blazes through “Time Wanna.” Beer spurts everywhere, the way you’d expect to see at a basement show. Zack lasers through the crowd to break it up, but putting a clamp on the drunken revelry proves impossible. As the set ends, an amped NE-HI joins the fun, each member chugging a can tossed onstage by friends in the audience. Perhaps such a measure of calculation is appropriate for a band that’s primed to be playing much larger, less cozy venues than The Empty Bottle sometime in the near future.